Septicflesh (formerly known as Septic Flesh) are a Greek death metal band from Athens, founded in 1990. Session vocalist Natalie Rassoulis joined for The Ophidian Wheel (1997) and again for A Fallen Temple (1998). The group split up in October 2003, and after the breakup, its members moved on to different or existing projects: Chris Antoniou continued involvement with Chaostar, which he formed in 1998, and Katsionis played guitar for Nightfall and keyboards for Firewind. TheDevilWorx formed a year after Septic Flesh's disbanding, and featured some members from Septic Flesh's original line-up. In March 2007, guitarist Sotiris Vayenas revealed his plans for a new solo project called Aenaos. On February 19, 2007, Septic Flesh announced a reunion for Greece's Metal Healing Festival featuring Orphaned Land, Rage and Aborted, set to take place July 20–22. On April 3, 2007, Blabbermouth.net reported the band reunited for a seventh full-length CD, for French record label Season of Mist. According to guitarist and composer Christos Antoniou, the release would feature a full orchestra and a choir, totalling 80 musicians and 32 singers. Septic Flesh finalized the new album, Communion, in Studio Fredman in Sweden; it was released in April 2008. By this time the band had changed its name from Septic Flesh to Septicflesh. According to guitarist Christos it looks better and states a new phase in the band. On September 10, 2009, the band announced that they had begun work on a new studio album, tentatively planned for release in the beginning of 2011. On February 12, 2014, the band released details about Titan. The album was released in June 2014. On December 15, 2014, it was announced that Kerim "Krimh" Lechner had joined Septicflesh as their new drummer, following the recent departure of their former longtime drummer, Fotis Benardo (a.k.a. Fotis Gianakopoulos). 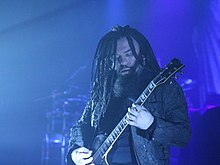 In June 2016 interview it was declared that, since early 2016, Septicflesh had been working on their tenth studio album, scheduled for release toward spring 2017. In early June 2017, band members claimed that Septicflesh's tenth album, titled Codex Omega, is officially due to release on September 1, 2017. Like as the previous album, Titan, Codex Omega was released through Prosthetic Records. The band signed to Nuclear Blast Records. "Portrait of a Headless Man"
^ "Septicflesh May Yet Enter the Golden Age With Their Titan". MetalSucks. May 16, 2014. Retrieved August 30, 2015. ^ a b True, Chris. "Septic Flesh > Biography". Allmusic. Macrovision Corporation. Retrieved December 11, 2008. ^ "Time Catcher". Septicflesh. Archived from the original on November 21, 2008. Retrieved December 11, 2008. ^ "Time Catcher". Septicflesh. Archived from the original on November 21, 2008. Retrieved April 18, 2009. ^ "Septic Flesh to Reunite for Greece's Metal Healing Festival". Blabbermouth.Net. Archived from the original on September 30, 2007. ^ "Reunited Septic Flesh to Record New Album for Season of Mist". Blabbermouth.net. ^ Roel de Haan. "Lords of Metal ezine". Lords of Metal. ^ "Featured Content on Myspace". Myspace. ^ "SEPTICFLESH Hard At Work On New Material". Blabbermouth.Net. ^ "Septicflesh 'Titan' New Album Details". Metal CallOut. ^ "SEPTICFLESH Begins Work On A New Album With Ex-DECAPITATED Drummer - Metal Injection". Metalinjection.net. June 7, 2016. Retrieved September 7, 2017. ^ "Septicflesh - New Album Update, Coming In 2017 - Metal Storm". Metalstorm.net. Retrieved September 7, 2017. ^ "SEPTICFLESH Begins Work On New Album; 2017 Release Planned". Bravewords.com. Retrieved September 7, 2017. ^ "Septicflesh News: SEPTICFLESH - Season of Mist, Metal Label". Season-of-mist.com. Retrieved September 7, 2017. ^ "SEPTICFLESH To Release 'Codex Omega' Album In September". Blabbermouth.net. June 14, 2017. Retrieved September 7, 2017. ^ "Discography Septicflesh". Retrieved June 6, 2008. "Septicflesh Chart History". Retrieved January 23, 2018. ^ "Septicflesh Chart History". Billboard. Retrieved January 23, 2018. ^ "SEPTICFLESH - Prometheus". April 1, 2015. Retrieved September 7, 2017 – via YouTube. ^ "SEPTICFLESH - Portrait of a Headless Man". September 1, 2017. Retrieved March 10, 2018 – via YouTube. ^ "SEPTICFLESH - Martyr". January 3, 2018. Retrieved March 10, 2018 – via YouTube.